A short History of the Fort. Harwich Harbour, at the mouth of the river Orwell, has always been the best safe haven for large ships between the rivers Thames and Humber. The rivers Orwell, Stour and Deben stretch several miles inland and were ideal highways for trade and raiders. 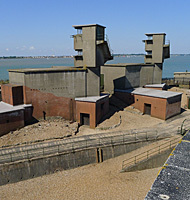 Landguard Fort dominated the navigable channel on the northern bank of the river Orwell, whilst the Redoubt at Harwich guarded the harbour entrance along with a large battery at Shotley. There have been a number of fortifications built on the Landguard Peninsula over the years. In 1543 Henry VIII had two blockhouses built which rapidly deteriorated, so in 1552 the guns were returned to the Tower of London. In 1628, a new Fort was built of earth revetted with wood. It was square with a bastion on each corner. In 1666, under Charles II, repairs were completed and a brick wall constructed around the Fort. 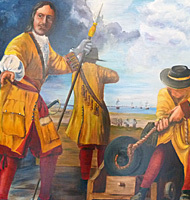 In 1667, during the second Dutch War, on the orders of Admiral de Ruyter, 1,500 Dutch marines (musketeers, pikemen, sailors (as grenadiers) and small cannon) landed at Cottage Point (now Cobbold's Point) and under the command of Colonel Thomas Dolman (an English officer who had served with Cromwell and, like many professional soldiers, had changed sides) attacked the Fort from the landward side. The Duke of York and Albany's Maritime Regiment of Foot, commanded by Captain Nathaniel Darell, repulsed the Dutch assault. In 1717, a new brick Fort was constructed, but gave way to a new structure in 1744, when a new red brick Fort was built in the form of a pentagon, with a bastion at each corner. These walls remain today. In 1871, the Fort was remodelled using yellow London bricks. All the internal accommodation buildings and the river facing battery, dating from 1780, were demolished. A seven gun casemate battery was constructed facing the river to house four 12.5 inch and three 10 inch Rifled Muzzle Loaded (RML) guns. Accommodation was in a semicircular block connected to the casemates to form an internal defensive position. The south east curtain wall facing the sea had one 12.5 inch and two 10 inch RML guns in casemates and the two land facing bastions with Barbette mounted 9 inch RML guns. In 1878, a submarine mining establishment was constructed by excavating a test room within the thick walls of the Fort, building an observation room and adding a main building on the east side of the Fort - known as the Ravelin Block. Stores and barracks were later demolished and are now underneath Landguard Terminal (part of the Port of Felixstowe). In 1901, because the existing armament of the Fort became obsolete, new batteries were built in front of the Fort facing the sea and river. These were named Left, Right and Darell's Batteries. After the main guns were removed, and for most of the 20th C. the Fort was used as barrack accommodation. In 1951 two of the old gun casemates were converted into a control room for ‘cold war' use. In 1956 the Coastal Artillery was disbanded and Landguard Fort no longer had a national military purpose. After 10 years of military neglect, the Fort was sealed up and left to quietly disintegrate until the 1980's when local interest was aroused.